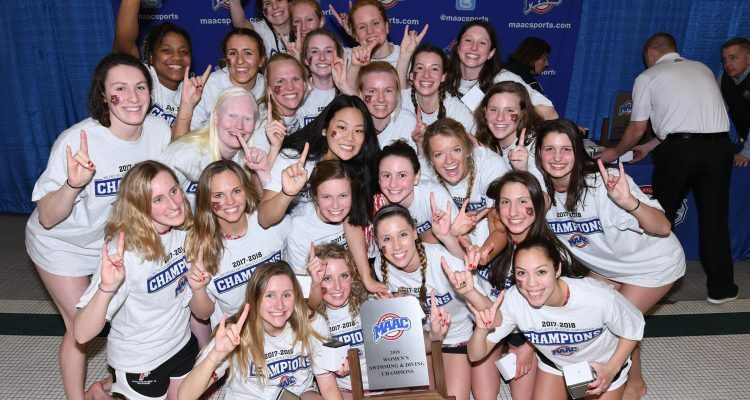 The Fairfield Women’s Swimming and Diving team achieved the impossible over the weekend when they won their first ever Metro Atlantic Athletic Conference Championship. After a disappointing 2016-17 season where they went 5-9 and finished in the bottom half for the MAAC championship tournaments, the Stags Swimming and Diving team bounced back with authority for an 11-win season, which is a new program record. Everything went right for the Women’s Swim and Dive team, especially for head coach Anthony Bruno’s first year. Head coach Anthony Bruno preached the motto again and again to “win the MAAC” and they accomplished that feat. 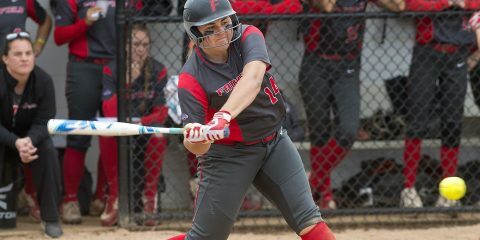 They competed for four straight days up in Buffalo, N.Y. starting this past Wednesday, Feb. 14 and held off Marist to win the 2018 MAAC Championship. 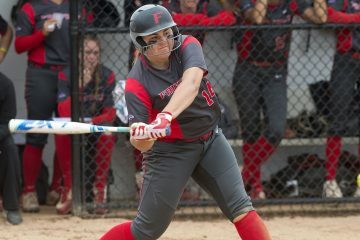 Fairfield needed an all-around effort to hold off Marist and capture that first MAAC title. They got that joint effort especially from Sara Ostensen ‘21 as she was in complete control for the 1650 Yard Freestyle finishing in 16:55.48. The Stags also had another swimmer finishing in the top 10 as Haleigh McLaughlin ‘21 finished in sixth place in 17:19.40. The 1650 Yard Freestyle was not the only event that had multiple swimmers in the top-10. In the 100 Yard Freestyle, Kelly Cordes ‘19 won the event with a time of 51.76 with Sarah Herbold ‘21 and Maria Nitti ‘21 finishing in third and fourth, respectively. This was an impressive showing for the Stags since they had three swimmers finishing in the top four spots. In the 200 Yard Breaststroke, Fairfield did not slow down at all. Sophomore Colleen Young and Emily Vlass ‘19 secured the top two spots of the event, with Young winning in 2:20.86 and Vlass finishing in 2:22.69. Junior Oreoluwa Cherebin also finished in the top five for the Stags with a time of 2:25.58. Having three Stags in the top five finishers genuinely displayed the dominance of the swimming and diving team. The Stags Women’s Swimming and Diving team displayed a relentless side that never subsided. Two first-years, Morgan Hansen and Sara Ostensen, claimed the top spots for the 200 Yard Butterfly. Hansen finished with a time of 2:03.65 while Ostensen completed the race with a time of 2:05.88. 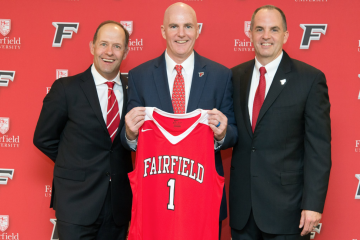 For this event alone, these first-years made a name for themselves and they kept Fairfield in a great spot to win the MAAC tournament. Ostensen also took home the MAAC Championship’s Most Outstanding Swimmer as well as Rookie Swimmer of the Meet. Bruno also secured MAAC Coach of the Year. Finally, the Stags sealed their MAAC championship victory by winning the 400 Yard Freestyle Relay where Nitti, Herbold, Cordes and Ostensen finished the race in 3:28.61. 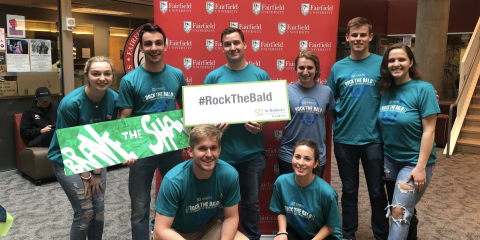 This final victory from Fairfield epitomized how successful they have been all year long and capped off what was a record-breaking season for the Fairfield Women’s Swimming and Diving team.